The buttons are just an interface example. They could be put on the upper bar while at the Adventurer's Inn, or discarded altogether, but it would be nice to be able to customize every character like above. While it's not my first choice, we could also go the static way and assign one type of inventory/equipment panels depending on interface (if we import that beautiful MM6 interface Vinevi made), having it change automatically when moving through continents or just being toggleable from the menu for a more permanent option. 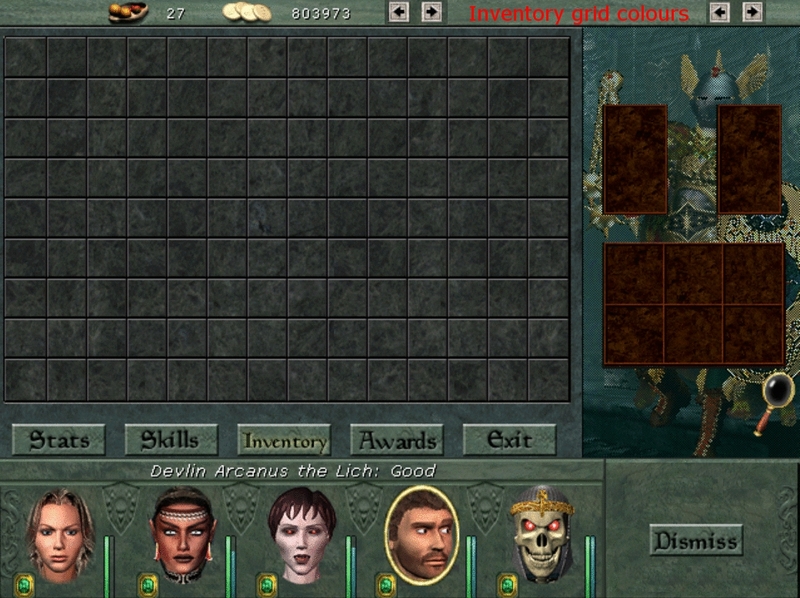 Assigning inventory grid colors to certain types of classes in a hardcoded manner is also an option. But yeah, optimally I'd like to have the ability to set up each character's inventory grid background + equipment slots separately and independently, as demonstrated above. Regardless of interface too. What do you think? Last edited by Xfing on Feb 28 2019, 17:05, edited 2 times in total. I think you should get some free cloud space. Mega gives you 50 GBs for free. Ulozto has unlimited space without registering (20 GB limit per file though if using the manager (I'm using it anonymously! ), 2 GB if through browser). It's still displaying for me though, in different browsers too... Postimage is a pretty reliable image hosting site you know! Last edited by Xfing on Feb 28 2019, 18:33, edited 2 times in total. 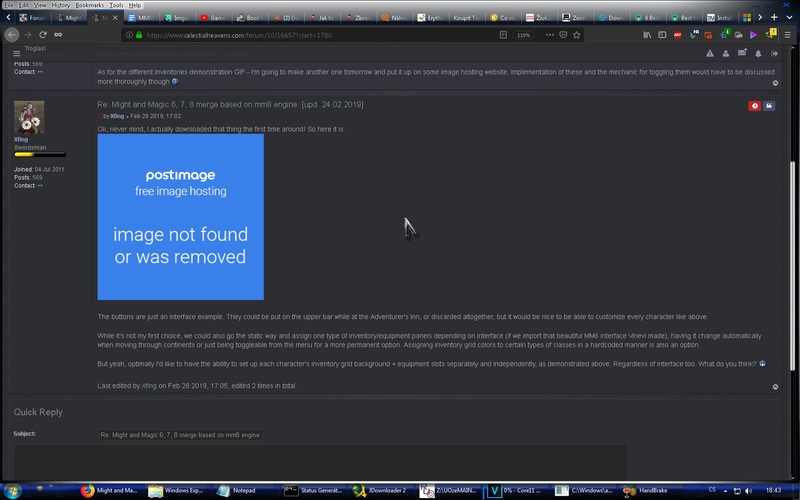 Xfing wrote: It's still displaying for me though, in different browsers too... Postimage is a pretty reliable image hosting site you know! Checking out the link directly worked. Quite nice. Still, some text explaining what those arrows are for being near them would be useful. Like "inventory colour". Also, it's missing pink. Add all the colours of a rainbow! Yeah, I'm not against that. Feel free to add it to the Suggestion tracker. You can use the suggest edit mode to do that. You can even put the animated gif there and it is going to work (animated smileys from this forum can be copypasted, so I am pretty sure so can the gif you made as well). I will then just push the apply suggested edit button. Just take care not to screw up the formatting. There are actually "magical tabs" at the end of sections (hidden symbols that actually take the length of a tab) so just make sure you put it in between the last entry and the hidden symbol. Templayer wrote: Quite nice. Still, some text explaining what those arrows are for being near them would be useful. Like "inventory colour". Very well, you've asked and I shall oblige. Edit in case Rodril sees it: It's for adventurer's inn only. Last edited by Templayer on Feb 28 2019, 20:42, edited 2 times in total. Yeah, you'd think they'd be able to GM the Elemental skills (Earth, Air, Fire, Water) at least, since Druids are linked with Nature. They did originally intend for there to be a Druid class in M&M8, and the Druid's Circlet within the Circle of Stone in Murmurwoods was to be associated with the promotion quest for them. Last edited by Daedros on Mar 2 2019, 0:21, edited 2 times in total. @Templayer - Doesn't that well in Kriegspire actually do something good though? Like +30 level temporary or something. Anubis wrote: @Templayer - Doesn't that well in Kriegspire actually do something good though? Like +30 level temporary or something. Which can lead to hilarious results, as seen in the video. Last edited by Templayer on Mar 2 2019, 9:27, edited 1 time in total. They originally intended for all the classes of MM7 to return, not just druid. They only had a handful of classes (Knight for example) finished, and the job of connecting the Jadamean races to the MM7 classes proved too time-consuming, something which they didn't have. Thus we got the half-baked system of MM8 where races and classes are put into a blender. Last edited by Xfing on Mar 2 2019, 11:01, edited 2 times in total. Giving them mana is solved by giving them various levels of meditation with my version on the tracker. Meditation is based on every class' base mana value and per-level mana gain, so knights will always have zero, regardless of meditation skill. If the skill were to bestow mana upon knights who normally have zero, that would require changing the game mechanics. But yeah, now I'm thinking it would be only fair to have some races give negative bonuses to skill caps too, as well as positive ones - that way humans could probably just remain neutral. I think Elves (the not dark ones) should be able to learn up to Master "Dark Elf" spells. majaczek wrote: I think Elves (the not dark ones) should be able to learn up to Master "Dark Elf" spells. And that is why the Dark Elf ability should be renamed to Fey ability. Charm and Traveler's Boon should be available to both in my opinion. But if you do not find both Elves and Dark Elves (magically) charming, then ... that is your perogative.